Two School of Education professors and a doctoral education student were honored with citizenship awards by the International Center of Syracuse (ICS). Associate Professor Alan Foley, who is jointly appointed in the departments of Cultural Foundations of Education and Teaching and Leadership and is the coordinator of the Disability Studies Program and acting director of the Center on Human Policy, was recognized with the ICS 2014 Citizenship Award for International Educator. 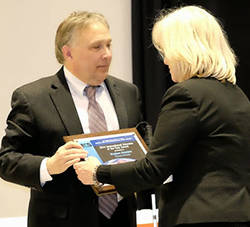 Professor Stephen Kuusisto, director of the Renée Crown University Honors Program and a Disability Studies Program faculty member, was also awarded the ICS 2014 Citizenship Award for International Educator. 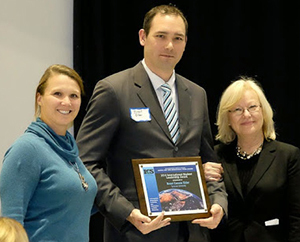 Doctoral student Brent Elder, who is pursuing a degree in special education and disability studies, received the ICS 2014 Citizenship Award for International Student Leadership. 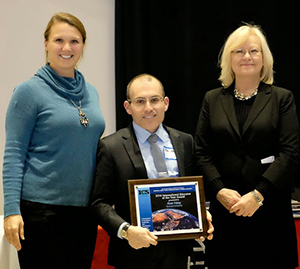 The recipients were recognized at the 2014 Central New York International Citizens Award Dinner at the Upstate University Institute for Human Performance. “All of these awardees contribute to international understanding of the needs and issues of people with disabilities and provide expertise in scientific, organizational and social aspects to meet those needs around the world,” says Elane Granger Carrasco, ICS Board of Directors president and associate director with the Slutzker Center for International Services. They were nominated for the award by Diane R. Wiener, director of Syracuse University’s Disability Cultural Center and research associate professor in the School of Education. Foley was nominated for excellence in teaching, international community outreach and commitment to people with disabilities all over the world. Foley’s research focuses on issues of disability and technology, and education. As part of the USAID-funded Kenyatta University-Syracuse University Partnership, he has been working with visually impaired students in Kenya. Kuusisto is a former Fulbright Scholar who travels extensively to many parts of the world to educate, advise and inspire reform and understanding for the benefit of people with disabilities and the societies in which they live. “Professor Kuusisto’s work in collaboration with the State Department, his research and his commitment to forward the efforts to bring inclusive understanding and knowledge around the vital importance of universal design in Central New York fills a deep need in our community not met in such a sterling fashion by many others in his field,” Granger Carrasco says. Elder holds certificates of advanced study in disability studies and in leadership in international and non-governmental organizations. “His willingness to volunteer in the community, to support campus and community efforts to promote understanding of disability issues and promote recognition of the absolute need for inclusion are deeply valuable and help to bring greater inclusion to Central New York,” Granger Carrasco says. Elder has also collaborated with the U.S. Embassy in Manama, Bahrain, and the Ministry of Education in Kenya as an education consultant and is engaged in ongoing critical disability studies research focused on the intersections of disability, poverty and education in post-colonial Kenya.